I finally got my Valentine's order from Darling Clandestine, after it took a little vacation detour to Hawaii! I grabbed a little of everything, also because I just love the little bottles Evonne put the set scents in! When it arrived, I opened everything just to take a quick whiff, and it all smelled amazing! I couldn't wait to actually test it on my skin. 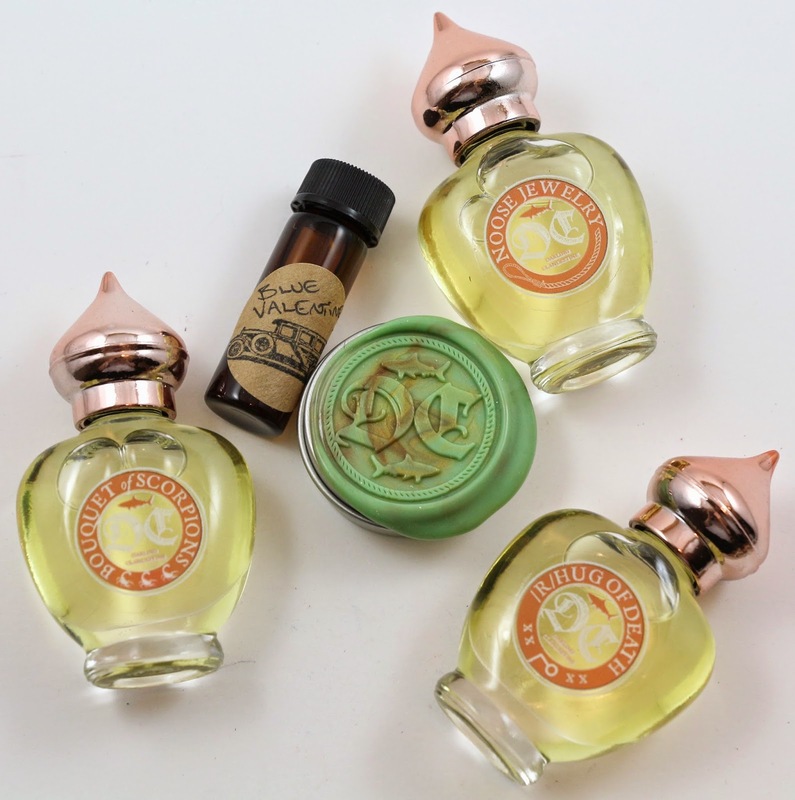 About - Darling Clandestine is an indie perfume company, located in Texas, owned by Evonne, and is known for some weirder perfume scents. There are seasonal releases, and a few that pop up out of their season every now and then. The entire perfume catalog is located here, and each scent has a "boss level" which is on a sliding scale of 1 being something that could totally pass as a mainstream perfume, to 10 being really weird smelling. Shipping - My order shipped 11 days after I ordered, and because it accidentally went to Hawaii before getting to me it did take a little longer to arrive. It finally was delivered via USPS 6 days after it shipped from Texas to California. 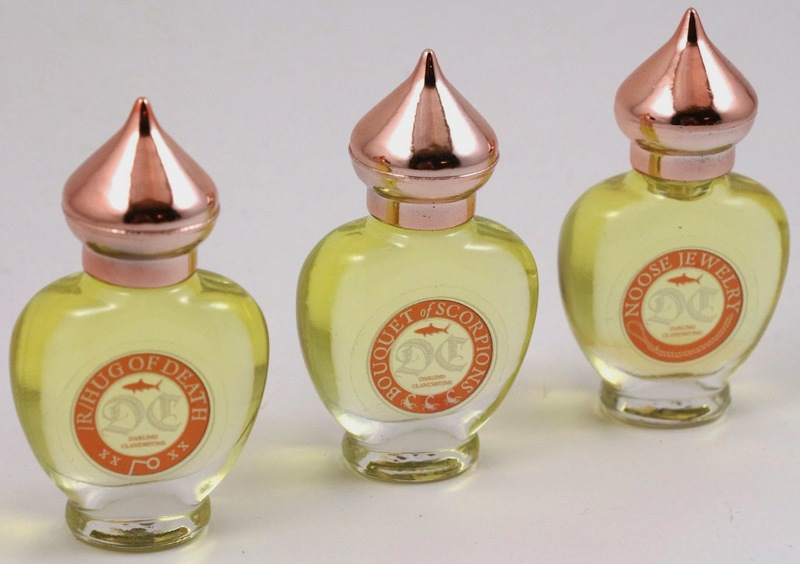 Product Size - She had available three scents in the full size perfume oil form, 1 returning scent in either a bitsy or solid perfume, and one only available as a full size solid perfume. Free Samples - I made quite a large order since I also added on a couple other items for a friend, so I did receive one free bitsy scent in Halochrome. Blue Valentine - "A moody bouquet of hyacinth and violet and poppies and figs, washed down with shots of real whiskey and bitters and delicate musks and mint." At first this is very clean smelling, with the mint right at the top. I get a bit of the florals, and musk, but it's mostly minty smelling. I like this one, I get more of the violets as it wears. But it's mostly a green clean sort of scent, definitely a bit fresh with the mint, and not too strong either. After a while, this does sort of turn...powdery? I don't know if that's the right term for what it starts to smell like, but is a little strange. Coma Cluster - "An all-botanical natural fragrance featuring classics like dark sweet coffee oil and cocoa absolutes, delicate essence of orange blossom, and an oh-my-you-have-got-to-be-kidding-me dynamite Bulgarian rose otto. Hugs close to the skin all night, all night." After reading the notes, I can sort of pick out each of the separate notes, but all together it just smells like a dark sweet gourmand. I love the solid perfumes when they are really full, because then I can just swipe them on right from the tin. 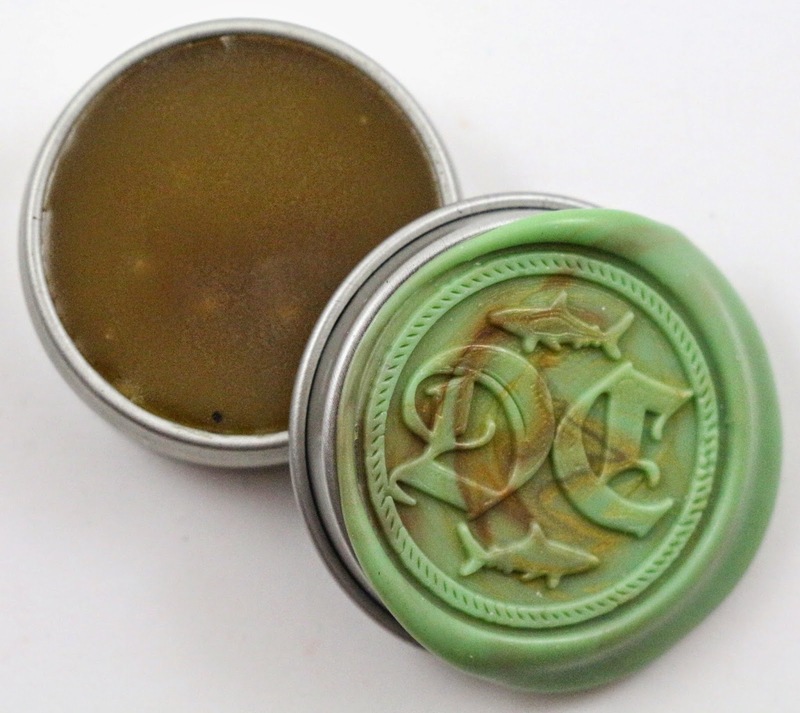 The beeswax she uses melts really quickly, so it becomes like more of a perfume oil on the skin. After a while on the skin, you get more of the rose and it turns into more of a florally gourmand. It can be quite strong, so use only a little bit if you're worried about that. I find that my skin seems to amp the scent the longer it's on, so be aware of that if you think your skin chemistry might do the same. It's really lovely, it definitely reminds me of Circassian and Falchion, Falchion being one of my favorite Darling Clandestine scents. Reddit Hug of Death - "Intense black tea infused with a trio of fruits—strawberries, blackberries and sweet red apples—grounded with vetiver and ginger and tonka bean." This reminds me of something that I can't place, but it smells kind of like a fruity tea. I can pick out the blackberry note and maybe a bit of the tonka bean. It's quite lovely, definitely fruity though, but not overly sweet. It has a nice balance. I did notice when I applied it, some of the black stuff from inside the cap transferred to my skin, it went away quite easily, but something to note about these bottles. Bouquet of Scorpions - "Whereas Tiny Ice Bees delivered grapefruit in a delicate wisp of silk, Bouquet of Scorpions serves it up in a ring of fire. Charred mesquite wood and torched sage smolder like a South Texas summer, finished with a splash of cool agave to dull the edge." Oh my god this is amazing. I love grapefruit, and this smells like you took a torch to one to caramelize the sugars. I definitely get the smokiness of the mesquite, and either the sage or the agave which is tying it all together. It's very citrusy and smoky though, so you have to be into that for this perfume. I will probably be wearing this all throughout the hot summers we get here in California. Noose Jewelry - "I chose true raw carrot, mulberry, honeysuckle, wheatgrass and (yes, I went there) a nice dirty green patchouli." I get a bit of floral at the start, the honeysuckle, and a green component which I assume is the carrot. It's like a fresh green floral, and reminds me of a candle I have that I like. I really like this one, I see why it is Evonne's favorite. I can't really pick out the patchouli, so if you were staying away from this one because of that, you might still like it if you're into florals, or honeysuckle. Overall, I really liked everything from this release! Everything sounded like something I'd like just from reading the notes, but sometimes there's something that just doesn't work. I'm happy to say I didn't have anything like that from this set of scents! I don't even know if I have a favorite, probably either Bouquet of Scorpions or Noose Jewelry. And I just love the cute bottles she went with for the trio, they are heart shaped and perfect for the feel of this release. I am so glad I got one of everything, I think I would have been pretty sad if I hadn't. I hope some of the trio scents make a return next year, as I wouldn't want anyone to miss out on them! Availability - All of these perfumes are out of stock, and some may return next year. Overall Satisfaction - My favorites were Bouquet of Scorpions and Noose Jewelry. As always, I loved everything and I can't wait to see what Evonne comes up with next. What did you think of Darling Clandestine's Valentine's collection? Let me know in the comments! I've always been confused by Darling Clandestine's catalog, so thanks for posting her discography. I didn't know that existed, but it's super helpful. No problem, it's definitely a lot to take in. And some new release scents aren't on there because I don't know if they're going to be around every year. They may just be a one time thing, like some of these.